I’m super excited to be part of the second annual Princeton Book Festival on Sept 15th. I’ll be leading a writing for young adults workshop in the afternoon and participating in an author’s panel in the evening. The panel will feature a reading from Surviving Logan. Registration is required for the workshop (only 10 spaces available!). With Sponsorship by The Princeton Council for the Arts & Presented by ORL – Okanagan Regional Library This year’s theme is “How the natural world is changing, and how we are changed when immersed in the natural world.” Each of our authors is passionate about this topic, as variously expressed in their nonfiction, poetry, journalism, or intrepid adventures. 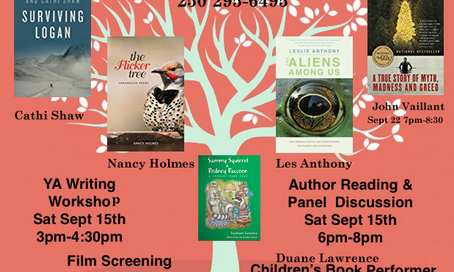 There will be a panel discussion with author readings, a film screening, a writing workshop, and a performing children’s author this year—something for everyone. Events are held at the Princeton Branch of the Okanagan Regional Library (107 Vermilion Avenue) and the Riverside Community Centre Theatre (148 Old Hedley Road).